Pay only P 2,824 a Month for 12 months. Or pay only P 5,348 a Month for 6 months. The compact, lightweight fi-65F high-speed scanner is ideal for front office, reception, patient intake, and retail environments. It quickly scans all major types of identification and small cards, including driver’s licenses, passports, military IDs, insurance cards, credit cards, photos, and small survey forms. High-speed USB 2.0 connectivity combines outstanding performance and easy installation. PaperStream IP Cleanup drivers (TWAIN and ISIS®) and PaperStream Capture scanning software are included to simplify integration and boost productivity right from the start. The fi-65F scanner increases user productivity with fast, one-second scanning at 300 dpi and coverless scanning. Coverless scanning eliminates the repetitive task of opening and closing the cover before and after each scan while still auto-deskewing, auto-cropping, and auto-rotating the document. 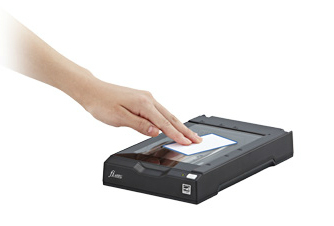 The scan button on the front of the scanner increases the speed of capturing multiple documents. The fi-65F scanner delivers clean, crisp scans up to 105 mm x 148 mm (5.83 in. x 4.13 in.) -- in color, grayscale, and monochrome with true, 600-dpi optical resolution. However, when time is critical, users can scan documents at 300 dpi in monochrome or 8-bit grayscale in just one second. And 24-bit color scans at 200 dpi take just 1.7 seconds. In keeping with Fujitsu’s long-standing commitment to safeguarding the environment, the fi-65F is the latest business scanner to adhere to strictest ecological regulations throughout the entire manufacturing process. The design and manufacture of the fi-65F meet Energy Star’s energy consumption requirements and the European Union’s Reduction of Hazardous Substances and Volatile Organic Compounds regulations.